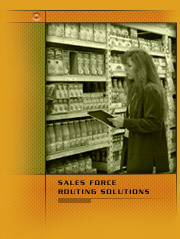 designed to increase the overall efficiency of consumer goods retail sales forces. NOT selling? Do you consider that DOWN-TIME? – We do, too! Do you pay for every single kilometer they drive? Do you want to minimize that? What is your actual retail coverage? 90%, 95% or 98%? Do you want to make sure you hit 100% every single month? – We do, too! at the same time? – We agree. However, this is no easy task to accomplish. ...there is LogicInRoute, a fully automated Sales Force routing and scheduling tool from LOGIC iN ACTION! Our unique scheduling and vehicle routing software was designed with the consumer goods industry in mind to provide 100% retail outlet coverage – in the most cost efficient way. It is an easy to use and flexible system, through which even a novice user can generate schedules and optimize routes. Let us know, if we can help you.